Credit : Courtesy the artist and Galerie Sfeir-Semler, Beirut and Hamburg. 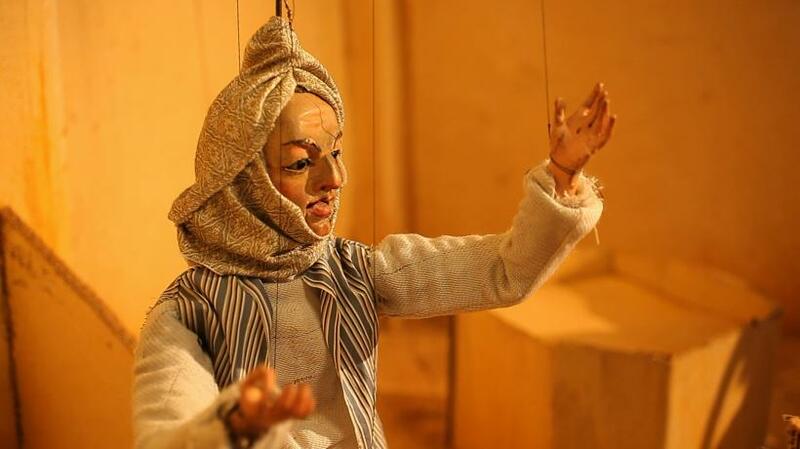 From translating a curatorial text into a Sufi qawalli that was sung by the (largely) Pakistani manual workforce at the Sharjah Art Foundation for the 2013 Biennial (‘Dictums’, 2013), to directing children to play adult roles in the retelling of stories by Egyptian novelist Mohamed Mustagab, (‘Al Araba Al Madfuna I’ and ‘II’, 2012 and 2013), Wael Shawky’s practice of putting historical, artistic and literary voices into the mouths of others also runs through his trilogy of films at MoMA PS1 in New York, shown under the collective title ‘Cabaret Crusades’. 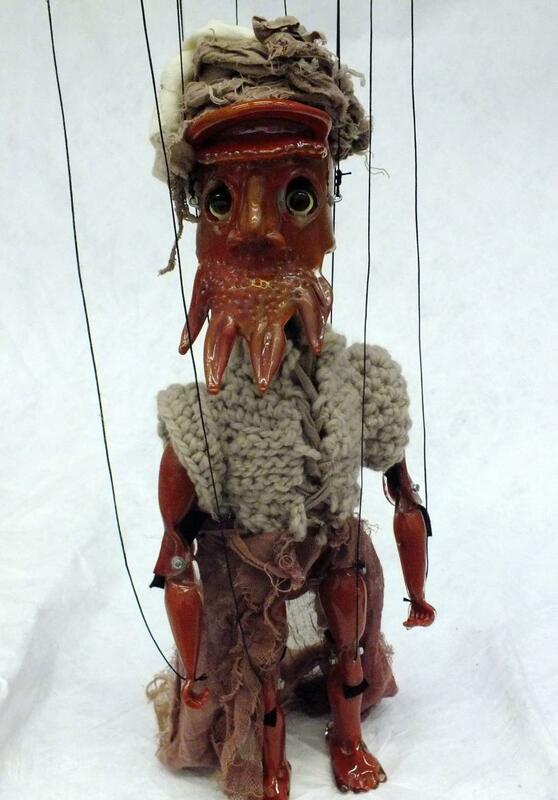 Children, manual workers and in the case of this exhibition, puppets and marionettes represent by their very nature a particular disenfranchisement and innocence relative to the texts that they narrate. That innocence strips these very texts of some of their largely masculine, ideologically domineering, and triumphant power. 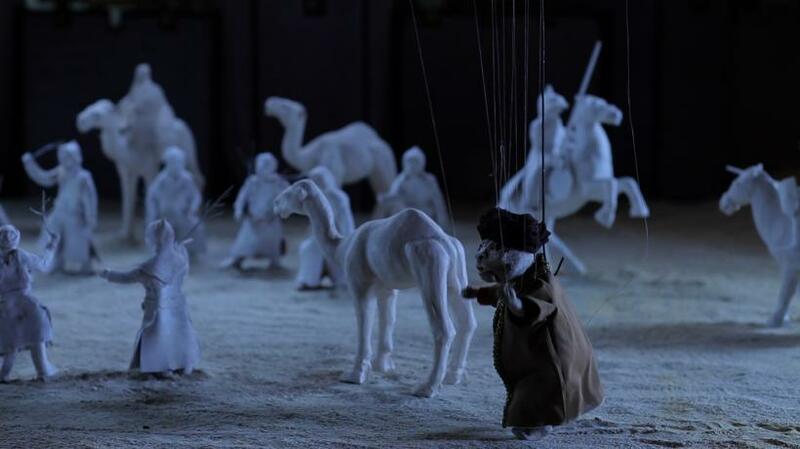 Shawky’s performers – animate and inanimate – thus replace the authoritarian voices of history with tones of the raconteur, of the chorus rather than the hero, and the persuasiveness fiction rather than the blunt convictions of history. 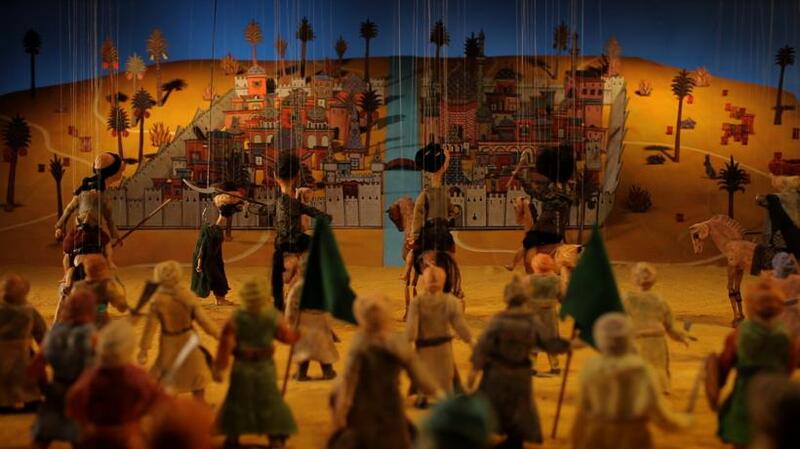 ‘Performing’ the histories of the ‘Cabaret Crusades’ trilogy, Shawky’s marionettes are filmed with distinctly cinematic conventions that include smooth pans, zooms, and decisive establishing shots. 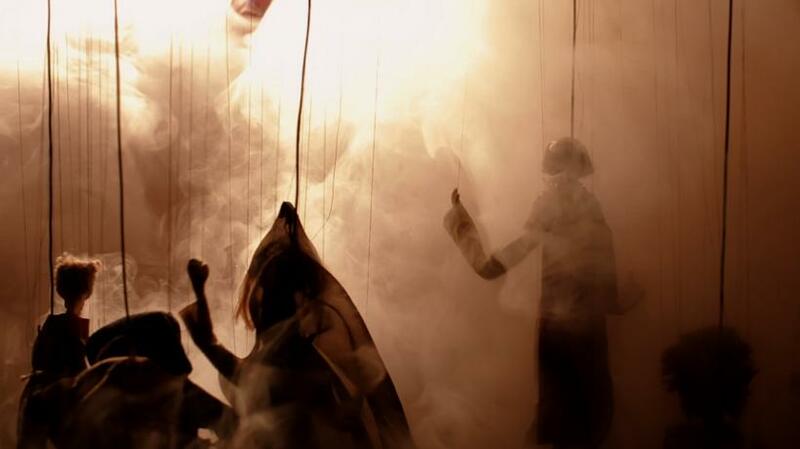 Such conventions pacify the ‘alienation effects’ of the marionettes and their inorganic and almost clunky forms involving visible strings, armaments, jilting movements, and even in the final film, the quiet clink of glass eyelids opening and closing. 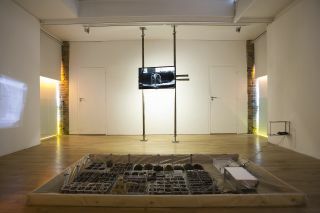 Initiated by Shawky in 2010 and thus before the rapid religious, social and democratic reorderings of the Arab-speaking world over the last four years, the three films shown here - ‘Cabaret Crusades: The Horror Show Files’ (2010), ‘Cabaret Crusades: The Path To Cairo’ (2012), and ‘Cabaret Crusades: The Secrets Of Karbalaa’ (2015) – each narrate different ‘instalments’ of the crusade wars in the 11th and 12th centuries, with the last part of the trilogy also describing Islam’s development since the 9th century and its split into various sub-empires. This last film begins with a long establishing shot of the ka’ba in Mecca, around which revolving planes slowly move. The revolving surface of this mechanical set is used frequently throughout the work, alternately decorated to become a battlefield, a city, a palace, or a garden. 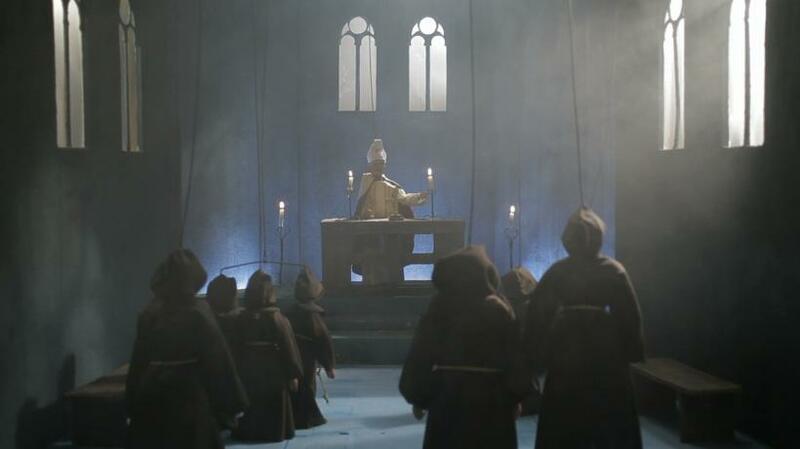 That holy structure of the film’s opening scene inhabits every later use of this revolving set, along with the very circumambulatory movements of figures and props upon it. 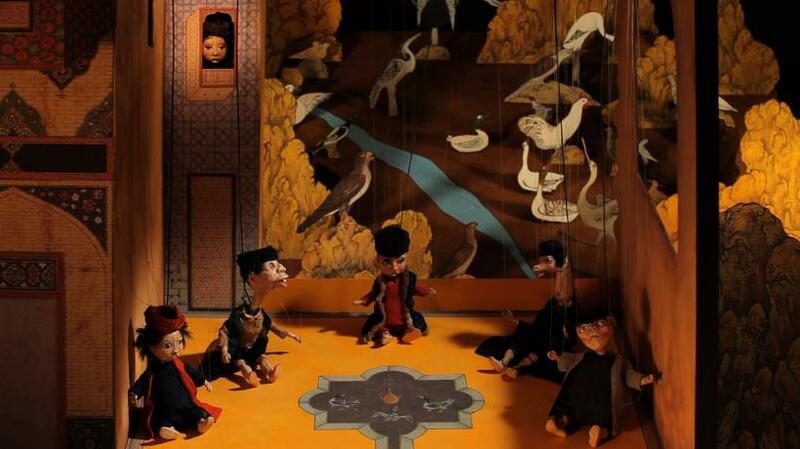 A rapid movement through the centuries of history within the trilogy entails that Shawky’s historical ellipsis thrusts multiple murders, marriages, conquests and conspiracies into a vertiginous spin. What calms this spin however, is an intensity of dialogue, reminding us that behind the activities of war and conquest are individual people speaking, debating, and planning. 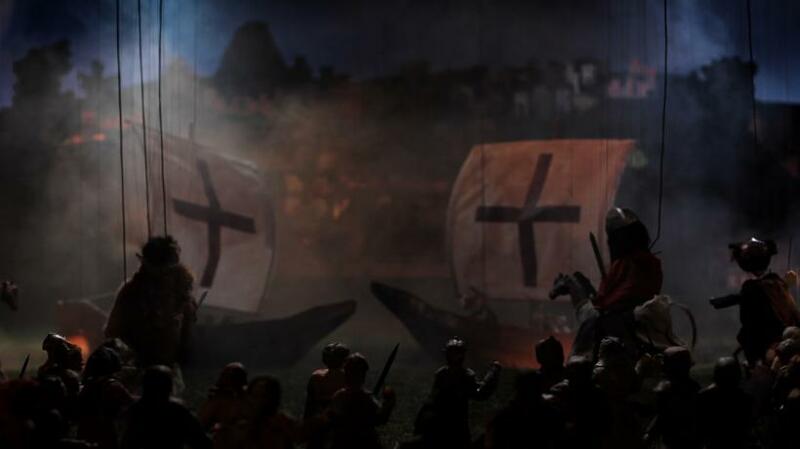 While it is often noted that Shawky’s ‘Cabaret Crusades’ trilogy is inspired by ‘The Crusades Through Arab Eyes’ (1983), a text by Lebanese historian Amin Maalouf, what is also striking about these films is that all dialogue is spoken in classical Arabic, be it from the mouths of German, English or French kings and crusaders, or the figureheads of early Islam. Not only does ‘Cabaret Crusades’ look at history “through Arab eyes”, it also narrates it in an entirely Arabic tongue, thus supplanting the languages that traditionally dominate historical and political scholarship. 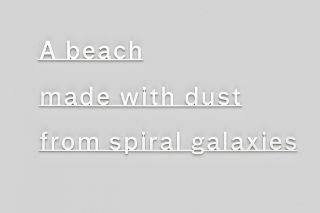 This exhibition at PS1 revolves around the final film of the trilogy. 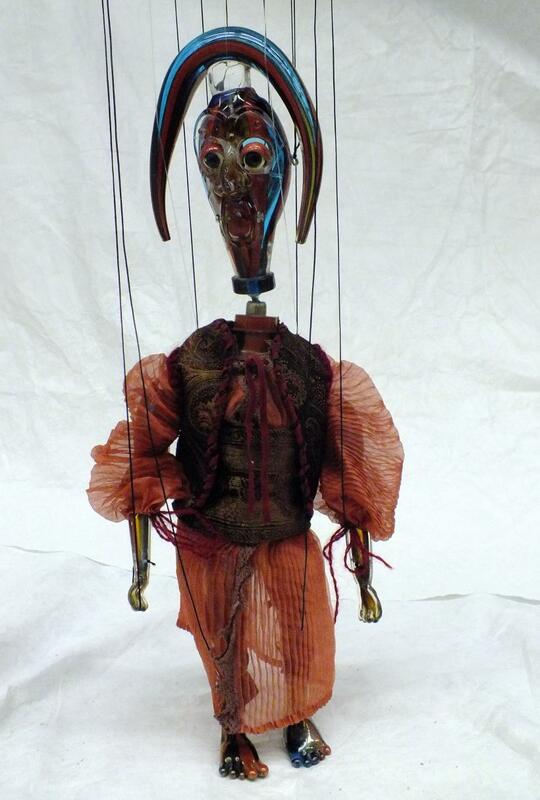 The slightly decrepit aesthetics of the marionettes of the first two films – with their cracks, dents and layers of paint on the faces, which become near-grotesque in close-up – inform the bizarre and often animal-like forms of the glass marionettes produced by Venetian glassmakers for the last piece. 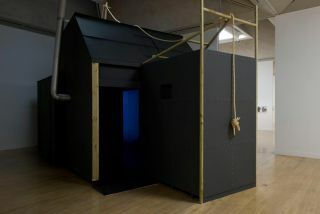 A tendency towards the surreal that informs the aesthetics of the trilogy is bolstered within the exhibition by a series of drawings that distort and rearrange architectural, human and animal forms. While these drawings could look like plans and sketches for the films, what they rather evidence is an artistic sensibility that delights in the distortion, re-sketching and conjoining of forms that take objects and events of ‘reality’ to an imaginative limit. 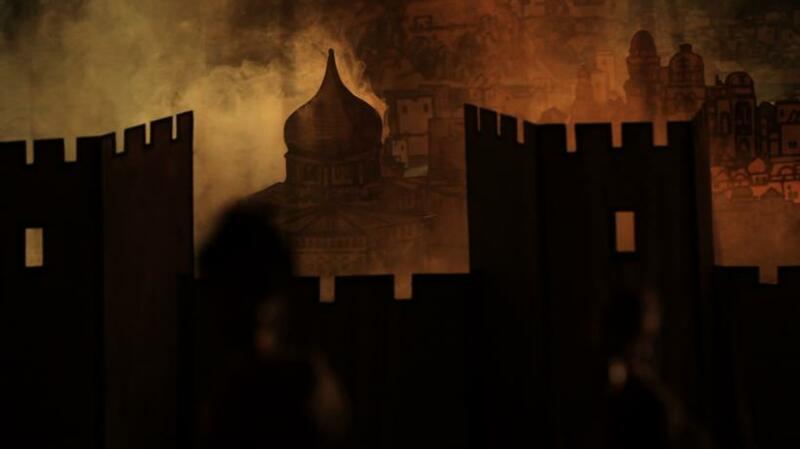 ‘Cabaret Crusades: The Secrets Of Karbalaa’ – the last part of the trilogy – is exquisitely executed, and by relation to the former instalments, decidedly more seductive. Though it is uncomfortable to say, more money, a bigger production team, and ‘richer’ materials truly elevate this film, the sparkle of glass marionettes in particular overtaking the quotidian nature of ceramic and wood. 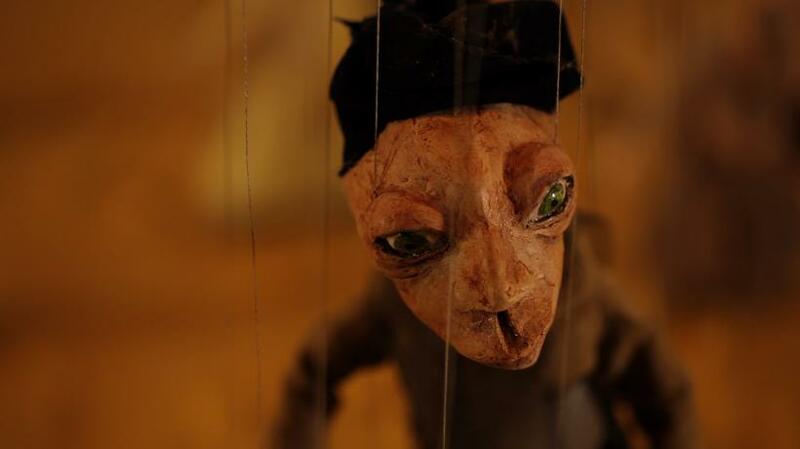 While all three works fulfil their promise and take their viewers where the artist wants them to go, with its extended duration, higher production values and embrace of ‘beautiful’ forms, ‘The Secrets Of Karbalaa’ has even more persuasive power and transcendent delight than its predecessors. It may sound verbose, but watching it I was reminded of the High Renaissance paintings that fill the walls of palaces and churches of great Italian cities – those decorative schemes by Giotto, Tintoretto, Raphael, Romano, Cortona and others that depict the spectacle of the heavens, biblical scenes and religious histories. 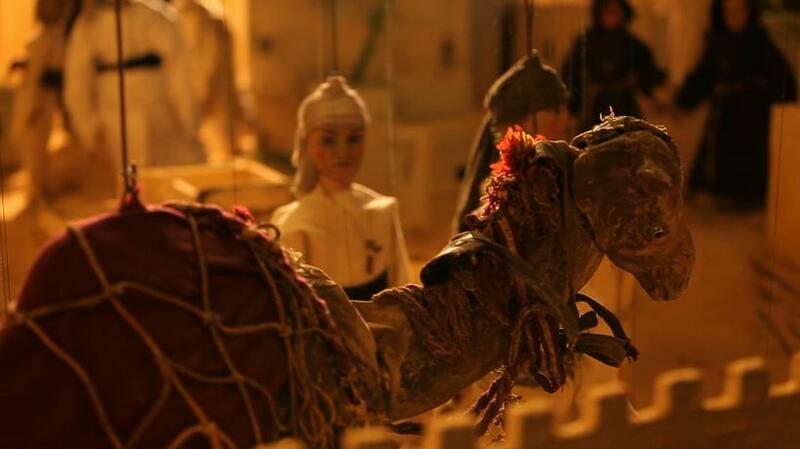 While there is a similar ellipsis of narrative to be found in Shawky’s ‘The Secrets Of Karbalaa’, the comparison really lies in what we think of as the qualities of the canonical masterpiece: in the breath-taking combination of ambition, dexterity, energy, visual beauty, and temporal depth and pertinence. 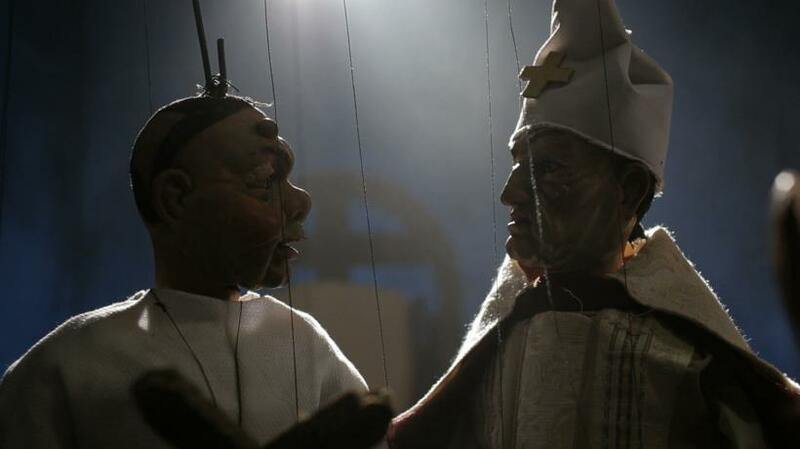 The ‘Cabaret Crusades’ trilogy is a masterly project. Its finale is a masterpiece.